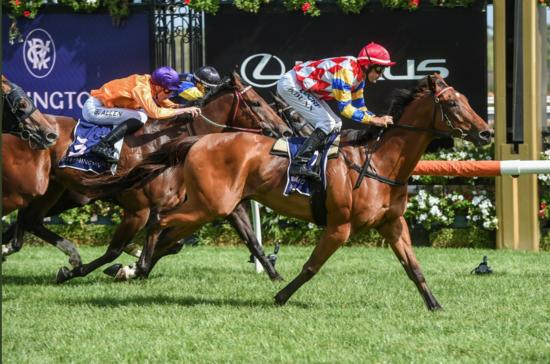 Trainer Tony Noonan is hoping the first Australian stakes win for Manolo Blahniq in the Listed Chester Manifold Stakes at Flemington can go some way to garnering the gelding some votes for the rich All-Star Mile at the same track. Five-year-old Manolo Blahniq was a Group Three winner at his second start in New Zealand as a two-year-old and he added his first Australian stakes win in Saturday’s 1400m race at his 24th career start. Noonan plans to chase more stakes wins with Manolo Blahniq in the next month, while he has thrown the gelding into the entries for the inaugural $5 million All-Star Mile at Flemington in March. “All the girls who like shoes, he’s the horse to vote for,” Noonan said. A son of the stallion Jimmy Choux, Manolo Blahniq is named for another high-end shoe manufacturer Manolo Blahnik. “He’s been going well for a while now,” Noonan said. “He’s now getting to the stage where he’s a bit stronger and more confident. “He was a colt for a while and he struggled with that. “We had to alter his race pattern a bit because he used to over-race and want to race a lot on nervous energy. But now he’s lovely and relaxed and he’s a consistent horse. Manolo Blahniq ($5.50) had to race three-wide from a deep barrier draw but Noonan praised the ride of Dwayne Dunn to get the gelding home by three-quarters of a length over Holbien ($6), with Takedown ($14) another short half-head away third. Manolo Blahniq brought up a winning double for Dunn after earlier piloting Godolphin two-year-old Microphone to a debut win.